Paul Robinson reports on his Facebook page that he’s done the 3rd ascent after Daniel Woods and Jimmy Webb of Mirror Reality (V14) in RMNP. 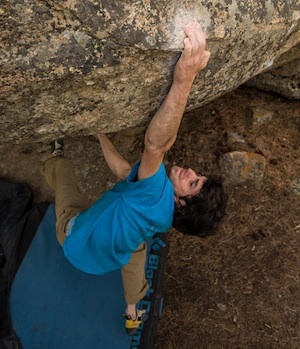 Here are a couple more pictures of him on the problem and check out this short video a friend of Robinson’s put together for a flim contest that features him on one of his FA’s in Albarracin. didn’t matty hong send MR also? The video from Albarracin appears to be an ad for Chevy. Is Chevy sponsoring Paul Robinson? Another $billion co. getting into rock climbing?